Voters have strong views of candidates and elected officials. Some of them are accurate. Some of them are nice. Many are not. Voters simply do not hold many candidates or elected officials in high esteem. Part of it is natural. A healthy mistrust or skepticism is built into the American psyche and has been since the founding of the nation. Unfortunately, over the last generation that inherent mistrust of government has also transferred over to individuals holding or seeking office. That cynicism while probably unfair is real and one all candidates must be aware of as it determines they are defined in the eyes of the voters. In my experience there are three ways that voters perceive a candidate for public office: as a politician, as a public servant, and as a people’s champion. Politician is a dirty word in modern American politics. It carries a great deal of emotional weight and baggage. As you know, when you don’t trust someone, it’s hard to like them. In fact it’s easier to hate or despise them. And once you decided to run for office, in the minds of most of your constituents you became a politician. I know you did not want to hear that, but that’s what the majority of the voters in your district think you are — a politician. They don’t know who you are, why you’re running, or what you wish to accomplish. All they know is your name is on the ballot, therefore you are a politician. Don’t let that distress or unnerve you. This is not an unsurmountable obstacle to overcome. It’s a reality that must be dealt with as a candidate. Every elected official you know in office today has faced the politician stereotype, and one way or another, they overcame it and won election. That means you can too. You get out there and campaign. You communicate to the voters through direct mail, door to door contact, telephone calls, Facebook interactions, you name it. If you do that successfully, you’ll be able to change the voters perception of you and your motives for running. Instead of seeing you as just another politician, the voters will perceive you as a public servant. Being referred to as a public servant is much better than being called a politician. Not only does it feel good to you, but it makes a voter more comfortable when they cast a ballot for you. No one wants to vote for a politician. Sometimes they have to because there is not a better option or it’s a matter of the lesser of two evils. Either way the voter does not feel good about their actions. They held their nose and marked their ballot for the politician. They are not true, dedicated supporters. The key to turning a voter into a dedicated supporter who wants to vote for you because they like you is to build a relationship of trust with the voter. You need to spend time with them. This can be done on their doorstep, on the telephone, or on social media. Being accessible and available goes a long way when it comes building trust. Like in any relationship, the more time we spend with a person, the easier it is for us to determine what they are about. The voters want to determine what you are about. That’s why it’s also important to have a very clear and concise message. You need to let the voters know not only who you are, but why you are running and what you wish to accomplish. Your goals must never be self-serving. Your goals must be bigger than yourself and benefit your community as a whole. When the voters have a sense of who you are and that you are running to do something good for them and their neighbors, you’ll be able to shed the stigma of being labeled a politician. You’ll be elevated to the level of public servant. Public servants win dedicated supporters and that wins elections. Yet, if you wish to go further in elected office, there is still a greater persona you can take on with the voters that can help make you politically invincible. Everyone loves the People’s Champion. It’s why the Rocky and The Hunger Games movies are monumentally successfully. We love the person who stands up and fights against overwhelming odds, especially when it’s done on our behalf. There’s nothing better when a voter feels that way about their elected representative. Now don’t expect a voter to refer to you as the People’s Champion. But they will refer to you as “my guy” or “my lady” when they see you in such a light. They won’t likely use such a basic but important accolade to your face, but they will use those words when describing you to their friends and neighbors. Most importantly, they’ll say “he’s my guy” or “she’s my lady” when explaining why they are voting for you. A voter won’t ramble off a list of things you want to do in office when discussing the reasons for giving you their vote. The fact that they see you as “my guy” or “my lady” is reason enough to cast a ballot in your favor. That’s because a candidate can’t become a People’s Champion based on what they want to do. You can only become a People’s Champion based on what you have already done for a voter. Like Katniss or the Italian Stallion, a candidate who is viewed as a People’s Champion has overcame impossible odds against staggering opposition on behalf of the voter. Typically a People’s Champion gets a problem in the community fixed that’s been neglected for years. A People’s Champion successfully tackles an issue for a constituent or group of constituents that conventional wisdom says will never be resolved. A People’s Champion often must take a strong stand for their community against powerful interests that often steamroll over other elected officials. The People’s Champion is more than a public servant. The People’s Champion goes the extra mile for the voters. The People’s Champion is willing to fight for their constituents even if they ruffle the feathers of the powerful or risk losing their next election. That’s when a voter knows a person isn’t just another politician and is far more than a good public servant. It takes more than running for office to be seen as a People’s Champion by the voters. It’s the hard work and integrity that you show in elected office that will bring about that persona transformation in the minds of the voters. It will make you stand out. It will build you a base of supporters that will likely be with you through thick and thin. It will give you shields against relentless attacks and make you practically invincible. Being a People’s Champion is about being a leader, and leaders are what American sorely needs in elected offices at all levels across our country today. If you're like most candidates, you want campaign signs. But the truth is, not all signs are good signs. 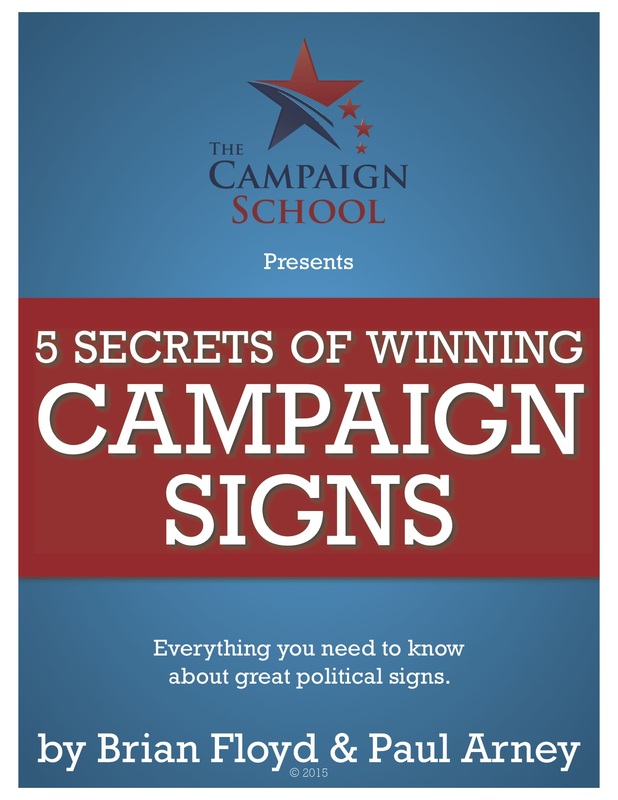 There are secrets to great political signs --- and we share them here in our eBook "5 Secrets of Winning Campaign Signs." There's only one way to get it—by subscribing to receive updates from The Campaign School. You can unsubscribe at any time. Need Robo Calls for Your Campaign? Robo Calls are an effective and inexpensive way to target and connect with the voters you need to win your election. Click here to get a quote for robo calls! Want to make live professional calls to contact voters, conduct surveys, or help get out the vote? Click here to contact RT Burns, Inc. for a quote. Find the Knowledge to Win Big on Election Day Here! ©2019 The Campaign School. Powered by the Get Noticed! Theme.